Package including three different items from Ambiance Bain. 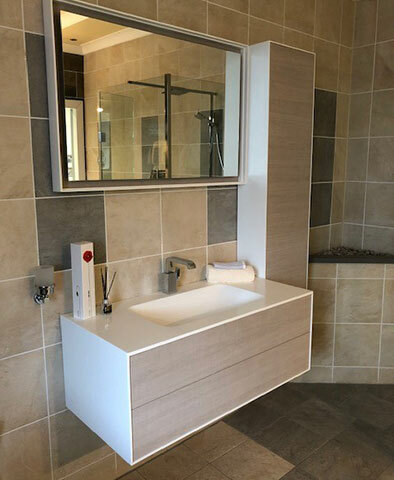 2 Drawer Vanity Unit in ‘Linen Ash’ finish with ‘White Gloss’ finish worktop and integrated basin. Basin does not include an overflow and basin mixer is not included within the listed price. Top drawer features storage dividers as seen in photo. Soft close drawers and push to open. Tall storage unit with ‘White Gloss’ finish and ‘Linen Ash’ finished door front. Push to open, soft close hinged doors. Interior features 3 gloss white shelves. Matching mirror – can be hung portrait or landscape with matching White Gloss and Linen Ash carcass. 2019 EKCO Edinburgh Kitchen Company LTD. All rights reserved. Registered in Scotland.